I have always wanted to try Maca powder because one of my favorite bloggers Gina uses it in many of her smoothies. I was lucky to get to try some from the brand Sunfood for review. Sunfood Maca Powder is an amazing superfood that can provide you with energy, endurance and strength needed for a variety of lifestyle conditions. Maca is a powerful adaptogen with the ability to balance and stabilize your body’s systems, and provide energy without overstimulating. Said to improve memory, oxygen in the blood, neurotransmitter function and libido, studies have also shown that the adaptogens in maca can boost your immunity and increase your body’s overall vitality by 10-15%. Containing 60% carbohydrates, 9% fiber and almost 10% protein, dried maca powder is high in lipid content, including linoleic, palmitic and oleic acid. Maca is mineral-rich with calcium, magnesium, phosphorous, potassium, sulfur and iron, and contains trace minerals, such as zinc, copper, selenium, manganese and silica. Additionally, as a good source of vitamins and sterols, Maca contains nearly 20 different amino acids and seven essential amino acids, giving you a wide variety of benefits for your on-the-go lifestyle. I added two teaspoons of this to my smoothie yesterday afternoon. It blended really well into the smoothie. I tried a pinch of it plain- let's just say stick to putting it in something. I think the health benefits of this are great too! Sunfood is a company that sells many different types of raw, healthy, and organic foods. It took me a long time to decide what to try because there are so many neat things. They also sell books, DVDS, appliances, etc. Check em out!! Thanks Sunfood for providing me with this Maca for review! 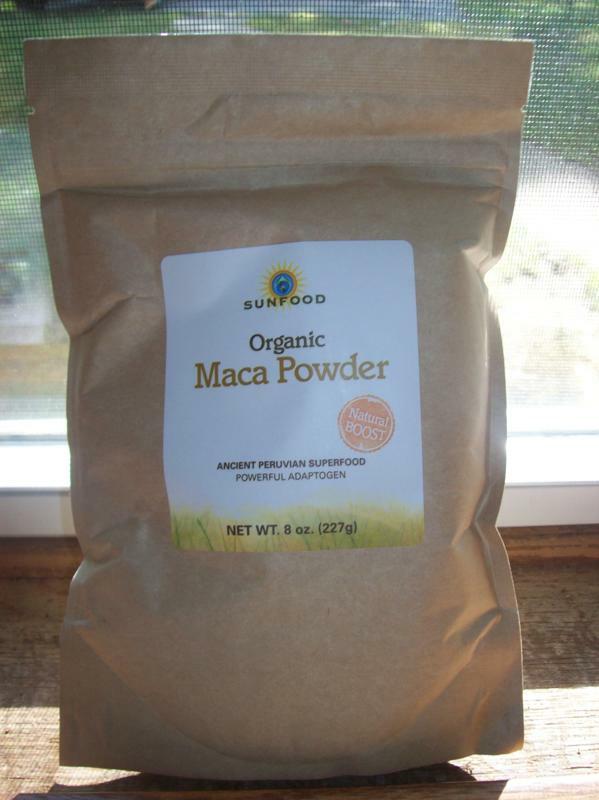 Thank you so much for your wonderful review of Sunfood Maca Powder! The next time you visit Sunfood.com, use coupon code "MANGO" to receive 10% off your next purchase. It's valid until 9/30/10 and cannot be used in combination with other offers or discounts. Thank you for your support! If you ever have any questions, please don't hesitate to contact us. Sunfood is no longer owned by David Wolfe and he doesn't support it. It is now owned my the son Monsanto! !